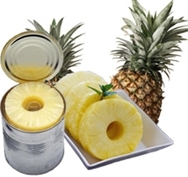 We at, Pineapple India manufacture and export canned pineapple slices both whole slices and broken slices, pineapple tidbits, pineapple chunks and canned pineapple pieces. Pineapples are safely canned in sweet syrup, water or fruit juice which helps reduce the sugar content of the canned fruit. Canned Pineapples Slices / Tidbits are packed in 425g x 24 Tins, 567g x 24 Tins, 850 g x 24 Tins, and 2840g x 6 Tins.